The Original Guide Series Goose Call is built to meet the demands of guides and serious waterfowlers everywhere. Crafted from acrylic, then meticulously hand tuned to match the sound of Canada geese. Introduced in September of 1999 the Guide Series Goose Call has been proven in Canada and the U.S. to be deadly on geese from early season right to the end of the season. A great choice for beginner or seasoned caller. Guide Series Double B is constructed of acrylic-impregnated or “stabilized” exxotic woods that give this call a unique buzz. Hand tuned with a brass retainer ring to prevent splitting and laser engraved with the Guide Series logo make this an attractive and deadly addition to any lanyard. The Guide Series Speck/Ross call was inspired on a trip to Alberta, Canada. The call was created to fill a need for a call with good volume to carry across the prairie and have a realistic Speck sound. Designed for calling specks, the call can also make the high-pitched bark of the Ross Goose. 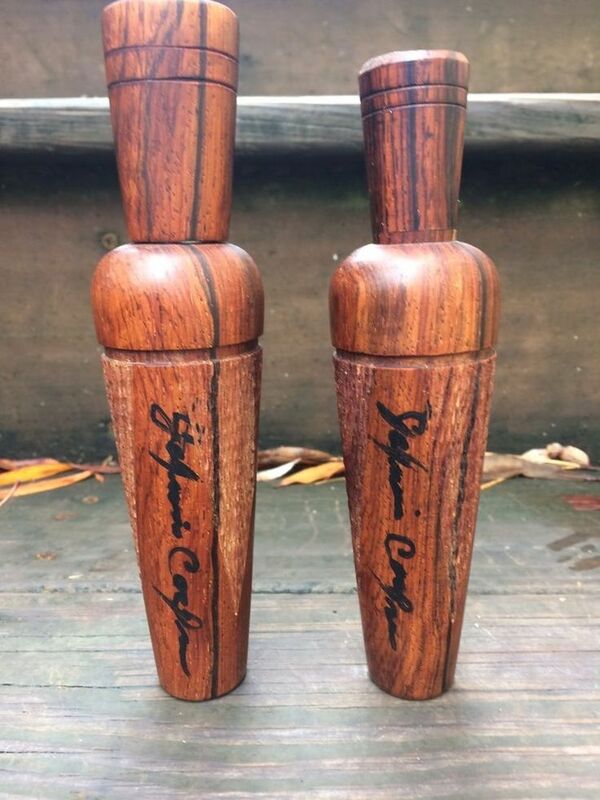 Each call is crafted of machined delrin with a hand-shaved reed and is signed and numbered. The operation of the call is like that of a short reed goose call, with anchored tongue and same hand positioning. The Guide Series I-5 KLR is an ultra high-pitched call designed too mimic the sounds of Alaska’s Cackling Canada Goose. Three years in the making, this call was designed through the collaborative efforts of Bill Saunders and long-time friend and pro-staffer Dave Smith. Born in the Wilamette Valley of Oregon, the I-5 KLR has proven its effectiveness on Cacklers, Taverners and Aleutians from Alaska to California as well as on Lessers and Hutchies from Canada to Texas. Each call is turned from super durable Delrin plastic and carefully tuned by Dave to meet the rigid standards of Bill Saunders’ Guide Series Calls.